Developing the Crown Estate in Regent Street – Kier Construction London’s Morley House Ultra Site project. Kier Construction London’s prestigious £36m Ultra Site project involves redeveloping the Grade Two listed Morley House into 44 luxury apartments and retail accommodation. Client Crown Estate commissioned Kier Construction to redevelop the building which dates back to 1924 and is located in the protected Regent Street Conservation Area. Outlining the project, Assistant Site Manager, Jack Grieve said: “The redevelopment of Morley House forms part of the ongoing Regent Street Vision investment programme and entails converting the building from its use of retail space and offices to retail and residential use. Work began on the project in November of last year, with completion scheduled for summer 2020. Speaking just after Kier was appointed as contractor, Cliff Thomas, Managing Director of Kier Construction London, said: “We’re very pleased to have been awarded this prestigious contract and are looking forward to working with The Crown Estate in redeveloping Regent Street, one of the world’s most popular shopping destinations. Explaining how Ultra Site status had boosted supply chain collaboration, Senior Project Manager, Mike Perera said: “Being an Ultra Site has further brought to the forefront how Kier, and now our subcontractors, improve our position within the local community; to date we have had really positive feedback from our supply chain. “Being an Ultra Site we challenged ourselves especially during demolition with the concept of improving the air quality, using different absorption mediums and maintaining exemplar records to allow true analysis of the NOx pollutants. The project entails converting the building from its use of retail space and offices to retail and residential use. Jack said: “As subcontractors are assessed separately by the Considerate Constructors Scheme for Ultra Sites, this prompted them to take on our core values and enable us all to work as a team to achieve a high score. 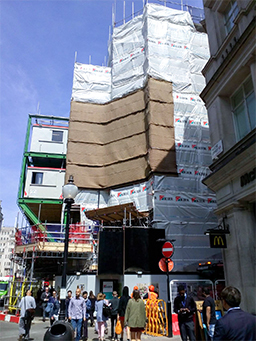 Kier Construction London’s Morley House Ultra Site project on Regent Street, London. One of the mediums used was a green living wall which, at the time of installation, was the largest in the country. Research suggests that urban vegetation can reduce the impact of pollution by acting as a filter and sponge for common urban pollutants, such as particulate matter. ‘Breath’ panels were also installed along Little Portland Street as a method to absorb NO2, SO2 and benzene molecules from particles in the air. NO2 diffusion tubes and particulate monitors have been installed throughout the external scaffold to ensure the records are as comprehensive as possible. Working on an Ultra Site has motivated the Kier project team to promote their values to local businesses and members of the public. For example, the team installed a hoarding to highlight the actions they took to improve the environment, such as their daily litter picking and the green wall. Summing up Kier’s overall experience of how being an Ultra Site has enhanced the project team’s consideration towards the environment, community and workforce, Jack said: “The site team have taken pride in the work they have done to increase the appearance of the project and therefore it has developed into a positive workplace. This is the latest in a number of construction projects Kier is delivering in London; last year it was awarded a contract to deliver a new £25m secondary school in East Dulwich, and recently completed the redevelopment of Parnell House in Victoria, providing office and residential space in a £34.5m project.